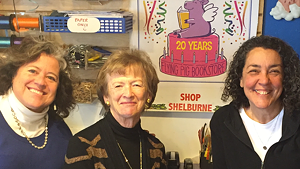 11/26/16: For two decades, Elizabeth Bluemle and Josie Leavitt have been sharing their love of reading with customers of the Flying Pig Bookstore in Shelburne. These former New Yorkers originally opened their bookstore in Charlotte and relocated to Shelburne a decade ago. Many know Josie, the original Vermont Comedy Diva, for jump starting the local comedy scene. Elizabeth has authored four picture books and helped publicize local authors like John and Jennifer Churchman of Sweet Pea fame. The pair separated as a couple four years ago and have continued to grow their shop and their family of book lovers with special events featuring authors. During Small Business Saturday, Elizabeth and Josie celebrated their 20 year anniversary with a steady stream of well wishers, shoppers and a few young adults who have been frequenting the Flying Pig for most of their lives. A larger birthday party will follow in mid-January and will also pay tribute to Josie who is leaving the store to work with the Pride Center of Vermont. After weathering 20 years as an independent bookshop with their good humor intact, Josie and Elizabeth have managed to keep the pig aloft with a little bit of help from their friends. 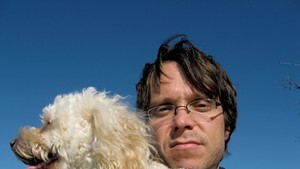 Music: Bert Hirsch, "Ro-ro-rolling Along" Kevin MacLeod, "Call to Adventure"